A visit in recent weeks to one of the local ‘Nature Reserves’ was, not unexpectantly, disappointing. When I first went there around seven years ago, it was a gold mine for wildlife as, along with wide range of bird and insect life, there was an abundance of mammals too – Deer, Foxes and Rabbits – all regularly seen. It wasn’t long that I noticed a big increase in dog walkers and in particular irresponsible ones. I would see dogs chasing after the many Rabbits, the birds breading on the small lake and even on one occasion, a Fox. Coincidently with this rise came the decrease in these animals. The visit recently was more out of hope than anything, but where there was once an abundance of Rabbits around the many warrens, they have all now been abandoned and filled in. Probably linked to this was the lack of sightings or signs of any Foxes. At a time when birds are gearing up for breading, the only birds on the lake I could see where two Swans and a Coot. Deer probably were around but now strictly nocturnal and since they seemed to live off the reserve on surrounding private land have been largely unaffected. There was still lots of songbirds to be seen and heard, but these can much easily hide and escape this kind of disturbance but for me a place like this is about the whole ecosystem and particularly the larger animals which not only helps make the place but is a good indicator how healthy environmentally it is. There was one glimmer of hope or possible another side of the gloom and that was spotting a Red Squirrel. Since the introduction of the Grey Squirrel, the Red has rapidly been disappearing from south to north. Where I would once regularly see these extremely endearing creatures, they are now an extremely rare sight in these parts. It was a surprise to see one on this occasion and reminded me of a time I would sit in a quiet part of any one of the local woods and watch them chasing each other up and down the trees - they would even come up close to you. I stumbled across this one which was feeding on the woodland floor and, characteristically darted partially up the nearest tree only to stop and look at me, showing curiosity. After disappearing from my sight I thought I had lost it only to find it had worked its way behind me and was watching me. A Grey Squirrel would simply vanish. There was one problem however as can be seen by the quick picture I managed to get and that it obviously has a problem. Probably some kind of mange as it had lost some of its fur. There was no sight of any others so this may have been a stray and looking around there wasn’t the usual signs of residential squirrels, however I haven’t seen any Greys in this woodland either so it’s possible they are hanging on here. It takes more to make a Nature Reserve than simply slapping a sign at the entrance and to say keep dogs under control. It’s unfortunate that we live in a time where people are becoming more and more selfish to others and indifferent to the environment and nature. It’s also unfortunate that no council that oversees these locations would ever have the bottle or even inclination to have dog free area reserves which would allow wildlife to thrive. I know from regularly visiting a privately owned reserve which doesn’t allow dogs, the difference is like day and night. People still visit but people don’t tend to go running after the wildlife and the local wildlife can adjust to seeing people walking by. This isn’t a dig at the dogs but squarely at the owners who, over the years I’ve found the vast majority couldn’t care in the slightest to others and who seem to believe that when they go out, wherever they are is purely for their benefit. When you think of a bird building its nest, you think of twigs, moss, leaves, maybe seaweed, but if you’re a residential bird that lives on a man made lake then you’ll take whatever is at hand (or beak). 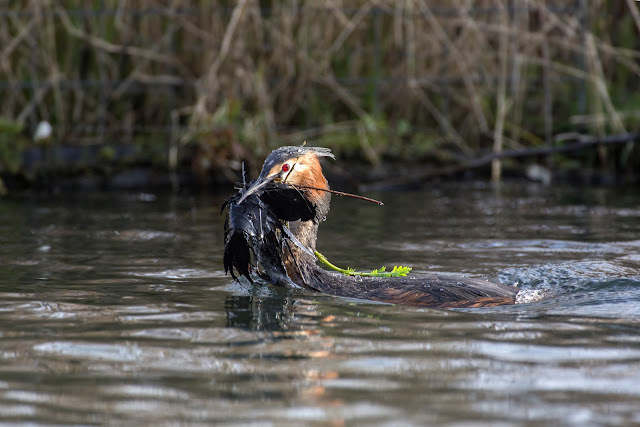 Watching a couple of Great Crested Grebes building their nest and it was amazing to see how much rubbish, literally, they were using. Various plastic bags, sweet and crisps and a various assortment of what was hard to identify was being used. I can’t imagine any of the plastics would be of any practical use as the nest material would need to be insulating but it didn’t stop them finding and using them. Where they found this man made ‘nesting material’ was also a bit of a surprise. It was at the bottom of the lake which makes you wonder just how bad the lake is as on the surface it seems fine. I suppose though, since birds take up residence there, it must ultimately be fine still, it does seem a bit strange to see a nest made up of Walker Crisps and Haribo sweet packets. It’s been a while since my last post – work has occupied much of my time unfortunately and I’ve rarely been out in the last four months, but hopefully I will be back out and about. My last few trips out have been visits to one of my favourite locations, especially now spring and the nicer weather has arrived. It’s nice to see the various greenery, wild flowers and hearing, what at this time of year, is a deafening sound of song birds but the woods don’t feel really alive without the larger mammals there, especially deer and in the case of the woods in this part of the country, Roe Deer. I believe they are the most common species of deer in this country and yet most people who have a stroll in their local woods will probably never see one, though they are there and their signs are everywhere. For such a relatively large animal, they do a remarkable job of remaining hidden. Even at this time of the year when the trees are missing their foliage and there is little to hide them in the way of ferns or long grass, they are still hard to see. For me there are two ways to see them. Find a time and location where they are and either sit still quietly (hidden) and wait, or walk quietly through the woods being very observant. For my photography, I prefer the sit and wait approach though it can mean hours of waiting with no guarantee of success. The following seven images were taken via this method. Waiting at a location I new they used and where the lighting was good enough to take good photographs. Although the use of netting helped hide me and using quite mode on my camera, the deer still suspected something was up although they walked by, the shutter sound still made them stop and stare in my direction. Just after taking these last three images, I heard some rustling behind me, but because of my position, couldn’t turn around easily so kept still. It is a little unnerving hearing that behind you whilst clearly getting closer. Suddenly there was loud barking. Clearly a male Roe Deer had come up behind me and must have been very close before being alerted by my presence. It continued to bark whilst moving away and by the time I did turn around I couldn’t see him because of some undergrowth although he was still thrashing around, moving away for a while then coming closer again while all the time barking loudly. After around twenty minutes he eventually left. The remaining encounters were from those of walking around. On two occasions I literally stumbled across them – one that was resting in the undergrowth the other I just didn’t see until the last moment. Other times I saw them in the distance and then hoped they would walk to a location that was open so I could get a good image, but they weren’t being very cooperative and were walking the wrong way, always too far away or there was a branch or something distracting in the way. Above is the typical kind of scene I was coming across. It looks empty and bare and yet the deer were there, you just had to look carefully. Often I would look and in the distance see one or more deer in the distance looking right at me, watching me. Below is a patch of woodland with no obvious signs of there being any deer, yet there are two of them watching. The main scene was taking from my phone held on top of my long lens whist the two inserts are taken of at least two deer that I could see. If you look carefully, one of them (right insert) can be seen but not the other which is much more hidden.